Parchman Farm is the maximum security Mississippi State Penitentiary for men. It is located on Highway 49W between Tutwiler and Drew in Sunflower County, Mississippi. 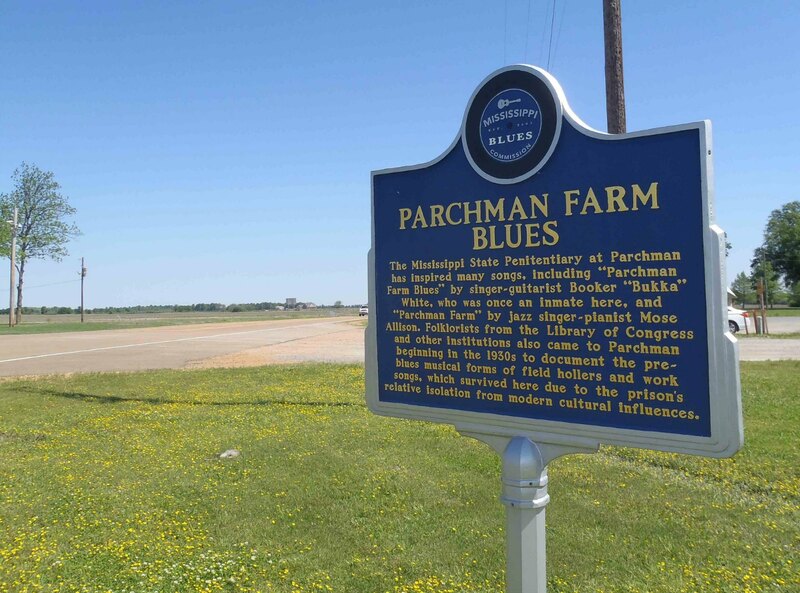 The Mississippi Blues Trail marker for Parchman Farm Blues is located directly across the highway from the main entrance gate of the Mississippi State Penitentiary. There is an unpaved parking lot immediately adjacent to the marker so you can pull off the highway to see it. 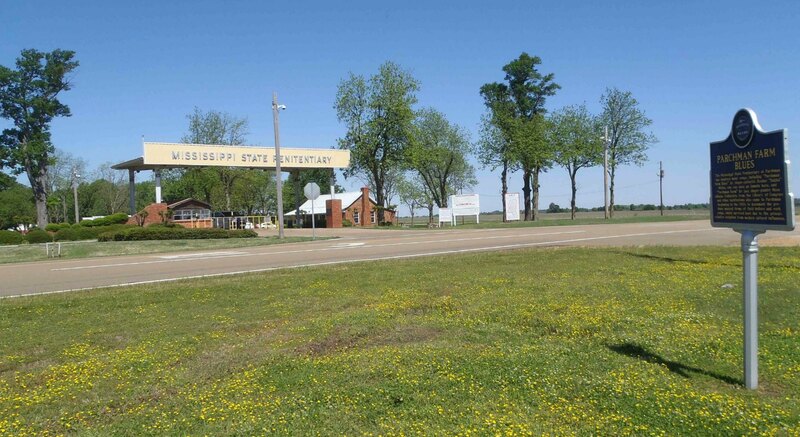 The photo below shows the location of the Mississippi Blues Trail marker in relation to the main gate of the Mississippi State Penitentiary. 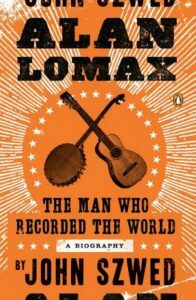 The first Library of Congress folklorists who came to Parchman Farm were John Lomax and Alan Lomax, who first came to Parchman Farm on 8 August 1933 during their epic 16,000 mile drive across the southern U.S. recording traditional songs and folk music. Prisons proved to be their best sources of singers and musicians; during their 1933 trip John and Alan Lomax visited 11 prisons in several states, discovering some major blues talent during their visits. At Angola State Farm in Louisiana they first met and recorded Huddie Ledbetter, who became better known as Leadbelly. After Leadbelly was released from prison, John and Alan Lomax became involved in managing his music career. Parchman Farm also proved to be a treasure trove of music. John and Alan Lomax returned several times in the following years to make more recordings at Mississippi State Penitentiary. When John Lomax returned to Parchman Farm in May 1939, the prison authorities introduced him to an inmate named Booker ‘Bukka” White, an established recording artist who was serving a sentence for a shooting. Booker White wasn’t interested in performing for John Lomax at Parchman Farm unless he was well paid for it; White was, after all, a professional musician who played for money. John Lomax wasn’t able to pay for a recording session but, as an inmate, White was in a delicate position with prison authorities who expected his cooperation with John Lomax. 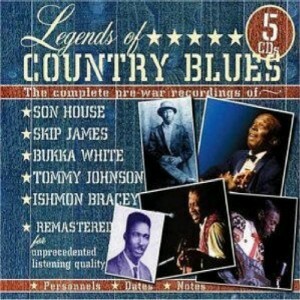 Here’s a video of Booker “Bukka” White performing Aberdeen Mississippi Blues and Po’ Boy in the 1970’s. Document Records collection of “Booker White’s Complete Recordings 1930-1940” which includes all Booker White’s recordings before, during and immediately after his time in Parchman Farm. Apart from Bukka White, other influential blues musicians known to have been inmates of Parchman Farm include Son House and R.L. Burnside. Alan and John Lomax also recorded female prisoners at Parchman Farm. They specifically mention one woman recorded in the sewing room at Parchman Farm; for a photo of female prisoners in Parchman Farm’s sewing room in the 1930’s, click here. For the full Mississippi Department of Archives and History online collection of historic Parchman Farm photographs, click here. 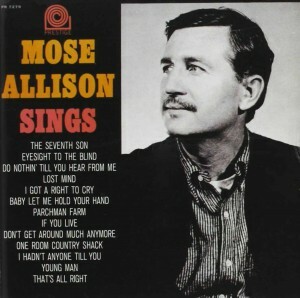 Mose Allison also wrote a song about Parchman Farm which is mentioned on the Mississippi Blues Trail marker for Parchman Farm Blues. 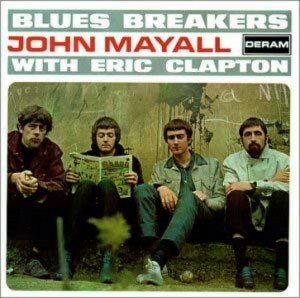 The best known cover of Mose Allison’s “Parchman Farm” was recorded by John Mayall’s Bluesbreakers and released on John Mayall’s influential 1966 album, Bluesbreakers With Eric Clapton. Here for a link to an mp3 version of “Parchman Farm” by John Mayall’s Bluesbreakers.